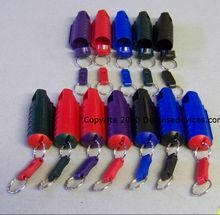 Included Police Magnum pepper spray with hardshell keychain in your colors. We can mix up the body colors with different bottom plug colors with different quick release colors. Just make your choices and specify how many you want of each combination. Click on the picture to make it larger. For example you may want a red body and purple bottom and no quick release. Just choose the body color, choose the bottom color and leave the quick release choice at "none". Then choose the number of units of each. The quick release is optional or you can choose within the same range of colors as the pepper spray key chain body and bottom.